We are a cross-training exercise program that combines strength training, boxing, and martial arts techniques into a 20 minute workout. The results build lean muscle, causing calories to be burned more efficiently. The result is clear - a decrease in body fat. Whether our client's goal is to get in shape, stay in shape, or just be healthier, The Blitz will help them reach their fitness goals by providing a private, enjoyable workout facility. No more wasting time at a "traditional" gym. 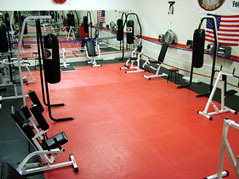 The Blitz offers a quality cross-training facility that combines strength training, boxing and martial arts techniques into a 20 minute circuit. You can build muscle while you burn calories and reduce body fat. We've already helped hundreds of men get in shape, stay in shape and be healthier - all with a 20 minute workout. Would you like to take control of your future? If so, then The Blitz could be right for you. A very reasonable investment gets you everything you need to start your own Blitz. We give you the business you have always wanted with the support of corporate headquarters and its proven system behind you. If you think you are ready for the rewards of ownership, The Blitz is your answer. Only one person is going to bring The Blitz franchise to your area. That person could be you. 90 percent of franchise businesses are still operating after 10 years, whereas 82 percent of non-franchise businesses have failed. Although only 8 percent of businesses are franchises, they represent 40 percent of all retail sales in the United States. Proven methods are often better than trial and error. A franchise usually carries higher resale values than non-franchised businesses. The Blitz will provide you with the tools you need to operate a 20 minute fitness center. It is our goal to help you succeed. Exclusive Territories: You will enjoy an exclusive territory. This assures that there will not be another Blitz operation too close to you. Ongoing Support: Your training does not end when you start operating your business. The operations manual will be a source of ongoing reference along with sales literature sent to you. State-of-the-art advertising campaigns have been developed to assist your expansion. Of course, phone consultations are always available. Comprehensive Training: Our classroom training at corporate headquarters, combined with our training manual, will equip you with the information you need AND increase your odds of operating a successful 20 minute total fitness center. We are determined to be the BEST '20 minute' fitness organization in the world. Our commitment is to help franchise owners run successful clubs. Our goal is to help men achieve a healthier quality of life and by so doing, strengthen the family unit. To learn more about the Blitz Gym fitness franchise opportunity, simply complete the form below.